The swirling, rainbow-bright abstract forms that appeared on the wall of St. Louis’ Moto Museum last September could easily have been mistaken for just another of the city’s street art murals. But in this case the eye only told half the story: to see the full picture, you needed to hold up your mobile phone. 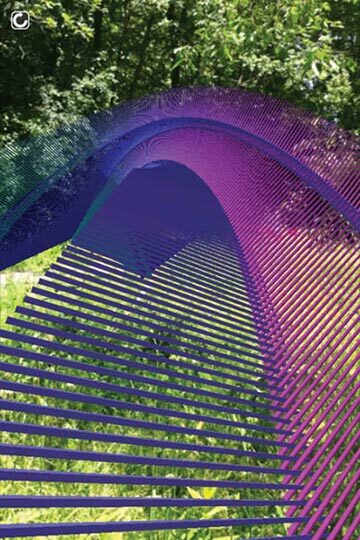 Created by art/tech duo The Heavy Projects, the digital, interactive piece was embedded with 14 basic shapes, which, when scanned with a bespoke mobile app, unlocked dozens more digital variations of the shapes for viewers to re-configure into their own compositions. We’ve already had augmented reality supermarkets, comics, store catalogues and billboard adverts, so it was only a matter of time before the art world went virtual, too. Indeed, the ubiquity of smartphones and the public’s increasing familiarity with AR apps in other spheres is beginning to have a tangible impact on how art is both created and displayed. 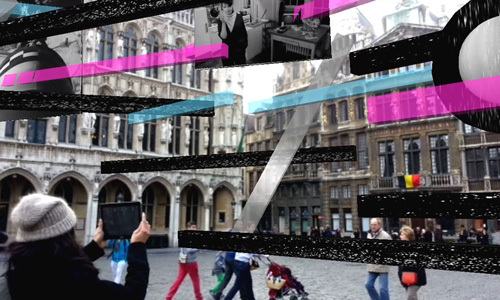 For museums searching for ways to bring their collections to life, the appeal of AR is clear – the technology allows rich media content such as images, videos, 3D environments and animations to be layered over real environments or objects. That the British Museum, such a venerable granddaddy of British art institutions, has seen fit to forge an ongoing partnership with electronics giant Samsung, shows it’s surely time to sit up and take notice of this trend. In November 2013, the museum trialled the first fruit of this collaboration: a new in-gallery app called ‘A Gift for Athena’, designed to help 7–11 year-olds engage with the museum’s Parthenon gallery. Children were given tablets pre-loaded with the app, which used image recognition of objects to bring up a virtual layer of games and facts about each. 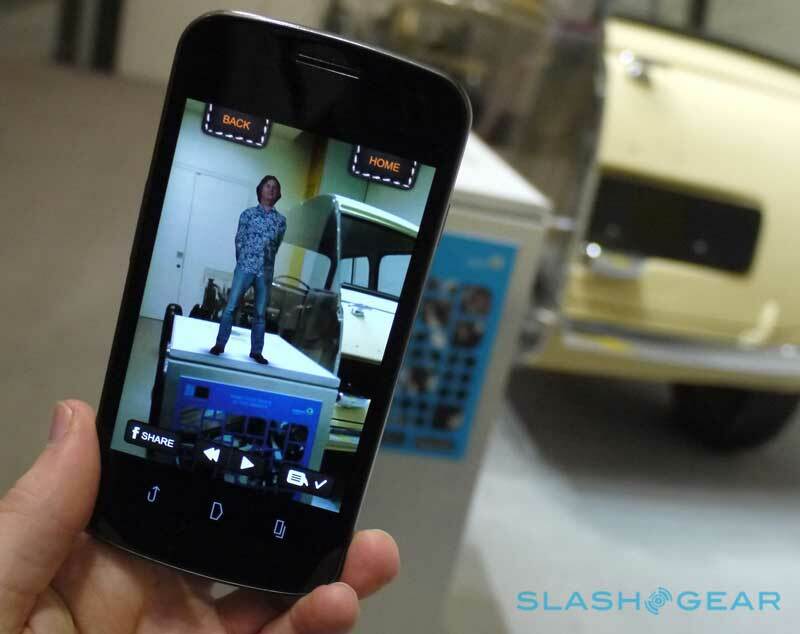 The Science Museum made a similar move with its app ‘Science Stories’, which conjures up an AR avatar of Top Gear presenter James May to act as one’s palm-sized personal guide through the Making the Modern World gallery. It’s not just younger visitors who enjoy exploring collections with this technology, though. For example, the San Francisco Exploratorium ran a series of adults-only late-night openings where galleries transformed into a surreal AR playground and allowed attendees to become ‘part’ of the art – being stalked by Dali’s giant ants or having a Magritte-style apple head super-imposed on their own. 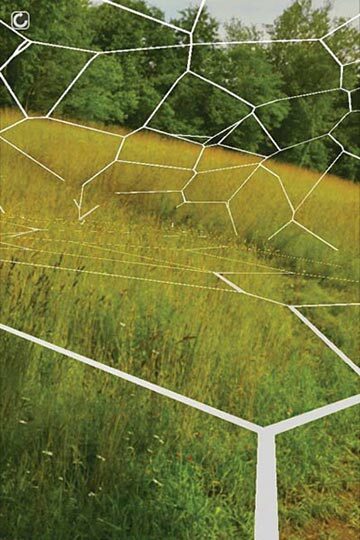 In another twist on the topic, Hudson Valley’s Omi International Arts Center has shown the possibilities for AR art where there isn’t even an original physical object. 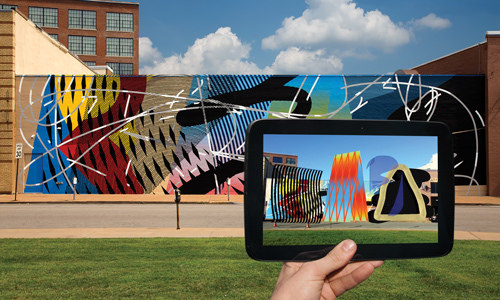 In what appears to be a vacant field space – in fact the world’s first permanent exhibit of AR art – digitally rendered architectonic structures are revealed on visitors’ smartphone screens. Perhaps AR will be another in the line of much-hyped tech that doesn’t catch on, the 21st-century equivalent of the MiniDisc player. Certainly, those who lament the idea of smartphones and these audio-visual augmentations infringing upon the hushed, hallowed gallery space will be hoping this is the case. Yet, as long as we remain so attached to our mobiles, this sort of ‘virtual overlay’ is likely to continue to permeate all aspects of consumer life, with our consumption of art being no exception.